Canadians are increasingly seeking out healthy food choices, but the array of food labels and claims crowding the marketplace can leave well-intentioned consumers confused and overwhelmed. A new, 90-second video aims to inform consumers about the rigor behind organic certification and the numerous benefits of choosing organic foods. As part of this year’s Organic Week, a national event celebrated across Canada from September 19-27, the Canada Organic Trade Association is challenging consumers to think about where their food comes from and how it was made with the Think Before You Eat video. "More than 20 million Canadians already choose organic products every week," said Matthew Holmes, COTA Executive Director; "Organic Week is the perfect opportunity for us to get out the message of Think Before You Eat: Think Canada Organic to all Canadians." 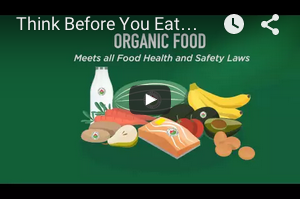 The new Think Before You Eat video clarifies that there are many confusing claims on food today, but organic is backed by federal regulation, and is overseen by the Canadian Food Inspection Agency. Organic meets all food and safety laws and is also inspected toorganic standards, making organic the most regulated food in Canada. from the 5,000 certified organic farmers and food manufacturers based here in Canada," said Holmes, adding: "and we’d love to see more farmers go organic too!" The video, released online and through social media, is part of the broader "Think Canada Organic" consumer campaign. Related “Think” literature and graphics are also being distributed to thousands of participating retail locations and hundreds of community events as part of Organic Week. The "Think Canada Organic" brand was developed with the support of Agriculture and Agri-Food Canada through the Organic Value Chain Roundtable, an industry-government advisory table. COTA owns the intellectual property and manages the brand on behalf of the Canadian organic sector.